Roads have been blocked in Spain’s Catalonia region as pro-independence supporters took to the streets as part of a general strike. Some public transport was disrupted and shops closed, but major stores were reported to be open as usual. Major motorways were cut off though, causing massive tailbacks. The strike was called by the two main civic groups who support independence, with demands that their leaders be freed from prison and sedition charges against them be lifted. Minor clashes were reported as police attempted to move some protesters. 3. 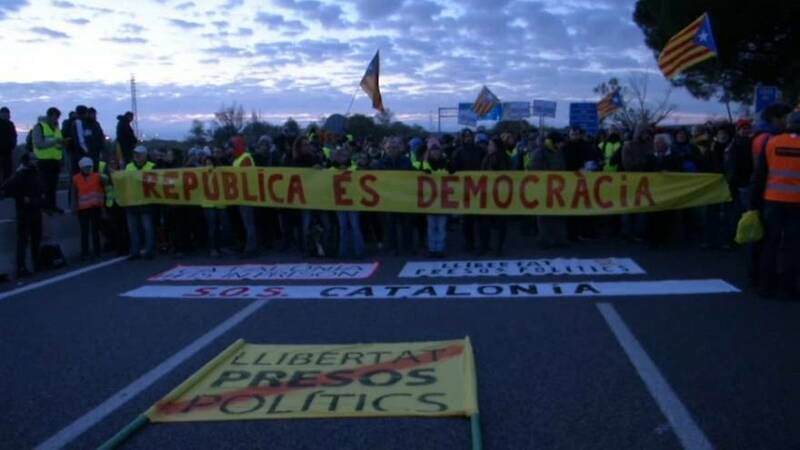 Many roads also closed during rush hour across Catalonia this morning. Here drivers sound their horns in protest at the separatist protestors blocking a motorway. As local political parties try to prepare for new elections set for December after Madrid took back control of the region, Spain’s Constitutional Court on Wednesday officially annulled the Catalan parliament’s unilateral declaration of independence last month. The events of recent weeks have plunged Spain into its worst political crisis in decades and raised fears about the effect on the economy.